St. Peter’s Square, March 12, 5 pm local time. Pilgrims watch voting cardinals take a vow of secrecy and loyalty just before the doors closed at the beginning of the conclave. 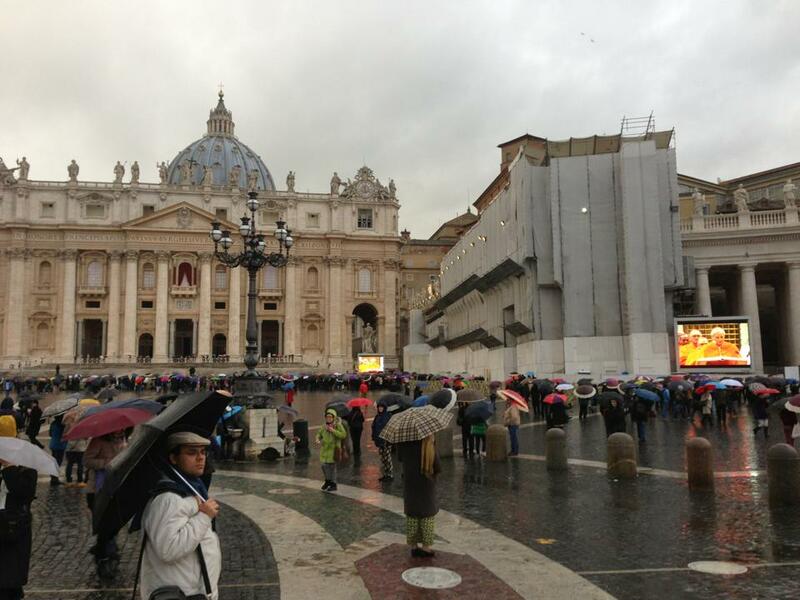 MARCH 12, 2013 — Thousands of people are now crowded into St. Peter’s Square, huddling under umbrellas in the rain. They have been watching this morning’s Mass for the Election of a Pope, which took place inside the basilica, and the 115 cardinal electors processing into the Sistine Chapel this afternoon. The cardinals then took their vow of loyalty and secrecy before the Master of the Papal Liturgical Celebrations declared, “Extra Omes!” (in Latin, essentially, “If you’re not a cardinal elector, hit the road!”) and closed the doors. Voting has begun! Rome has been cold and wet these last several days. This morning was warm and sunny, but by early afternoon, the sky clouded over, small hail stones fell on the Vatican and the temperature plummeted. I’m rubbing shoulders and elbows with 5,000 other journalists from around the world, here to witness history — the election of the 266th man to lead the Roman Catholic Church. Much has been written about who the new Pope will be. The consensus seems to be that his two main tasks will be to reform the Curia–the governance of the Church–and to implement the New Evangelization. Neither is a small task. Most people agree that we need a Pope with the tenacity to clean house at the Vatican and the personality to present the Gospel in a new and attractive way.Who that man will be will remain a mystery until a short time after the bells of St. Peter’s ring again and white smoke billows from the chimney over the Sistine Chapel.